If you're in the market for a new iPad, there's a good chance you'll want a protective case or some other new accessories. But whether this is your first iPad, or you're upgrading from an older model, you're probably wondering whether existing accessories—those originally designed for the iPad 2—work with the new model. Perhaps you're planning to purchase some gear in a local store or online, or maybe you've already got a few add-ons you'd like to reuse. We spent much of Friday testing the new iPad with accessories originally made for the iPad 2, and for the most part, the news is good—the new model works with many existing iPad add-ons. But not all. Here's the scoop. As we discussed last week, the new iPad is exactly the same height and width as the iPad 2, but ever so slightly—0.03 inches, to be exact—thicker. The lens for the new iPad's improved camera is also a fraction of an inch bigger. But the second- and third-generation iPads are otherwise physically identical—all the buttons, switches, jacks, and ports are even in the same locations. The two models are also electrically and mechanically identical insofar as accessories are concerned. This means that for many type of accessories, existing offerings should work fine. This includes non-cradle chargers and batteries, and other non-cradle dock-connector accessories; headphones; screen protectors; and anything else that doesn't depend on an exceptionally precise fit with the back of the iPad. If it simply plugs into the iPad, it should work. If it sticks to the iPad's screen, it should work. If the iPad rests loosely in it, it should work. Similarly, most iPad stands and mounts—especially those that hold the iPad loosely in a groove, slot, or cradle, or on easel-style supports—work perfectly with the iPad. Even Twelve South's HoverBar, which uses a rigid-plastic, corner-hugging cradle, fits the new iPad, albeit with a tighter fit than when mounting an iPad 2. Finally, all the bags, packs, and protective sleeves we tested, whether made for the iPad 2 or the original iPad, accomodate the new model without problems. 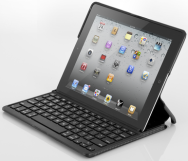 Where it starts to get dicey is with form-fitting accessories that were designed to fit the iPad 2 precisely. We've tested dozens of form-fitting iPad 2 cases, keyboard cases, stands, and mounts today, and a few didn't accomodate the new iPad at all, while others worked but didn't fit quite right. We encountered frequent fit problems with folio-style cases. With many of these products, the case held the new iPad just fine, but the case's openings for accessing the iPad's controls, cameras, and ports didn't line up perfectly. And on a few others, the front cover wouldn't properly activate the iPad's magnetic sleep/wake feature. The reason here is that these cases require you to slide the iPad into the side of a leather, rubber, or fabric frame, and the new iPad's extra thickness often kept it from sliding all the way in. The result is that the iPad didn't quite line up with cutouts for the camera, side switch, buttons, or ports, or the cover didn't close properly. If you've got an ill-fitting folio case, it will likely suffice until you can get one that fits better, but it's not a great option. Another possible issue is related to cases with screen covers. The iPad 2 and third-generation iPad include a nifty magnetic sleep/wake feature—when used with a compatible case, magnets along the right-hand edge of the iPad cause the tablet to automatically sleep when the case's cover is closed, and wake up when the cover is opened. Based on our testing and reader reports, it appears that the location of these magnets may be slightly different on the new iPad compared to the iPad 2. As a result, some—but not all—cases originally made for the iPad 2 don't always trigger the magnetic sleep/wake feature. On the other hand, we expected to have problems with shells and skins, which tend to be form-fitting, but many of the ones we tested—especially those made of silicone or other materials that stretch a little—fit the new iPad well. For example, iLuv's Flex-Gel Case fit the iPad 2 like a glove, but it's just flexible enough that it also works with the new iPad, if a bit tighter. For some others, such as Speck's rigid Smart Shell for iPad 2, the case fit, but once it wrapped around all of the new iPad's edges, it was obvious the case was made for something slightly thinner—there were a few gaps between the iPad's body and the case where the case was being stretched a bit too much. In general, the shells that didn't fit tended to be those made of especially rigid material, those that barely extended around the sides of the iPad, and, of course, those that had little to no wiggle room with the iPad 2—these often couldn't firmly attach to the new iPad. In terms of keyboard cases, our experiences were similar. While looser folio-style keyboard cases for the iPad 2 work with the new model, others don't quite fit. For example, the first of our two favorite keyboard folios, Adonit's Writer, didn't even allow us to insert the third-generation iPad, while the second, Zagg's ZaggFolio for iPad 2, accommodated the new tablet, but tightly enough that it was difficult to remove the iPad. The overall lesson here is that if you're looking to buy an iPad case or other form-fitting accessory, the safest approach is to get one the manufacturer specifically claims is compatible with the third-generation iPad. If you've spotted an iPad 2 case, keyboard case, or similar accessory you like, and it's at all dependent on a precise fit, you'll want to check that fit yourself before buying, or check the Web for reports from other iPad users—or buy from a vendor with a good return policy. Macworld staff editor Leah Yamshon contributed to this article. Updated 3/19/2012, 11:48am, to correct error about compatibility with Dodocase cases. Updated 3/20/2012, 1:45pm, to add information about case compatibility with magnetic sleep/wake feature.